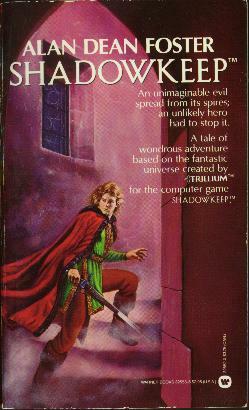 Trillium collaborated with sci-fi / fantasy author Alan Dean Foster on Shadowkeep, starting the trend of publishing mass-market fiction related to current computer games. (This was years before the novelizations of Bard's Tale, Ultima and the Infocom games.) It's not an adaption of an already-existing work, either: Notice both the book and game bear the Trillium logo on the cover. Considering what this investment must have cost Trillium, you'd think they'd've tried to promote the game more, reissuing it along with their pure adventure titles. A side note: Trillium also had plans to recruit fantasy author Philip Jose Farmer to do a novel and game based on his works. I've spoken to Farmer in person (he's a local author here in Peoria), and apparently they never told them about any of this. It's likely the project was scrapped after Shadowkeep, and it's equally possible that Farmer has simply forgotten about it (he's a pretty old dude). At any rate, the game, titled The Grand Adventure, was never released.